While you read this, please open your heart and send prayers to a beautiful and gentle woman….. It is also a “Give away” from my Spirits for all of you to use when needed. My Spirits told me to tell you, that you can help her, by giving her a Rice Blessing. Because I am not in F. And you can get to her in the hospital and you can do it right there. Well, Get some Rice, a hand full. Yes, any odd uncooked Rice will do. Get a small container with clear water for Blessings. A tingsha bell, singing bowl….. even a gentle song on a guitar will do it. Have none of these? Take a wine glass and snip against it’s rim with your finger….. Sing, humm, chant over it – or say a mantra….. to invocate your items. Ask it to help you bless Patty and to help her heal. Then go to her with the Rice in a little dish and also a little vase of Water. Then take a small pinch of Rice and touch her gently on the following places of her body while – maybe saying : Blessings of health and healing – or your mantra… or whatever comes to mind, that will be of help to her…. Now discard the rice – wastepaper basket of a piece of paper, so you can take it away and burn it is even better. Head first and then all the way to her left arm pit. 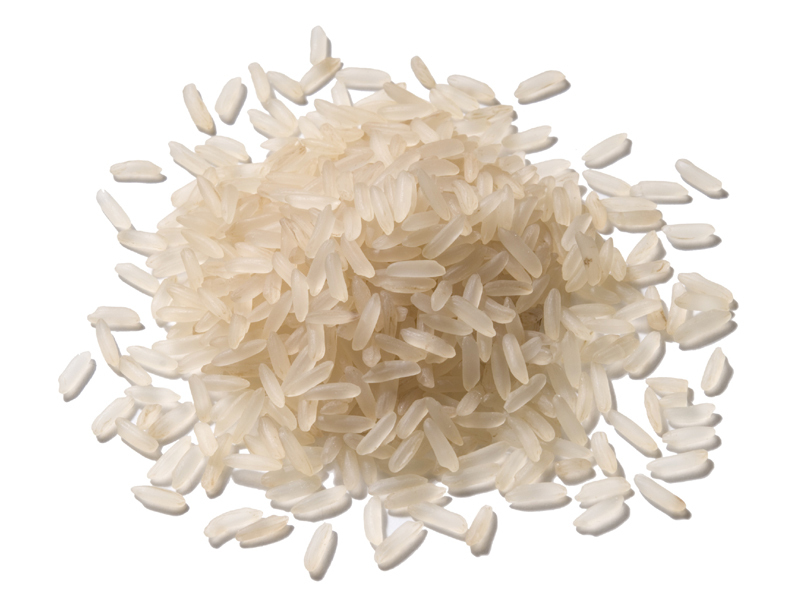 Below her = the ground or end of bed…..
Then discard the Rice you used. Let her say a little prayer for her healing, say one with her. Get rid of the used Rice but leave her the Water, so she can bless herself with it whenever she needs it. Heart felt Blessings to both of you and all, who are involved! 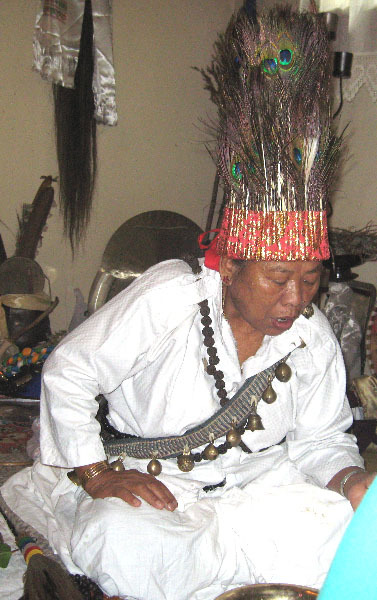 Nepali double sided shaman’s drums. There were several, but not for long…..
2 smaller ones were taken immediately. I held out my left all feeling hand and – there was one that had A LOT of Power. No, Bhola said, that is my spare drum…. Towards the end of the session the female side of the drum is used, and then the rhythm becomes a 3/4 beat [O o o O o o O o o]. During this time the shaman starts calming and slowing down, and eventually the beat changes to a 2/4 [O o O o O o O o] and eventually a 1/4 [O000 Oooo] before it comes to a stop. 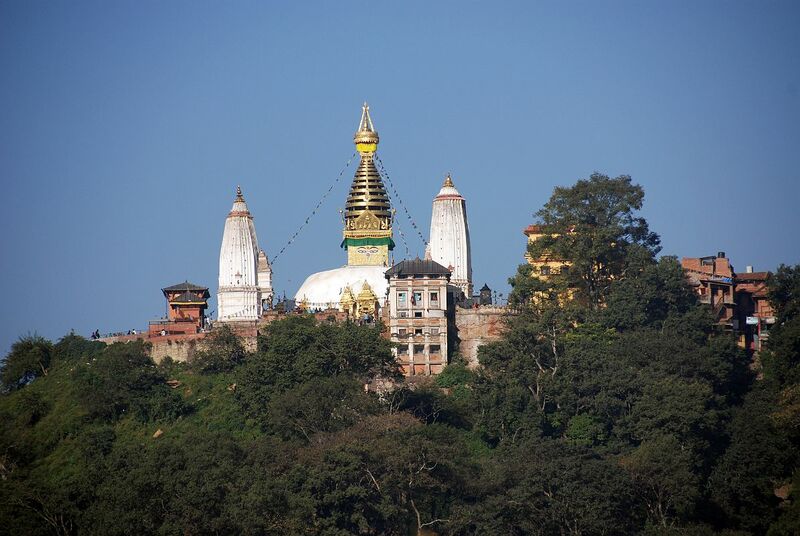 From our first night on the roof top garden of the Varya hotel, the mighty stupa of Swayambhunath, watching over the valley with its all seeing eyes, had been a constant presence in my nightly personal Medicine rituals. 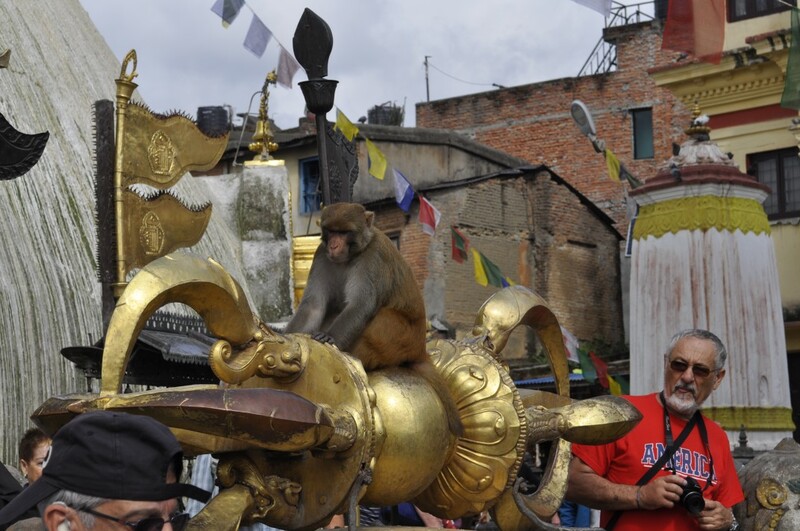 Anothe Spirit of the land, of place, but also a personified Spirit of the people, of the creative chaos that is Kathmandu. 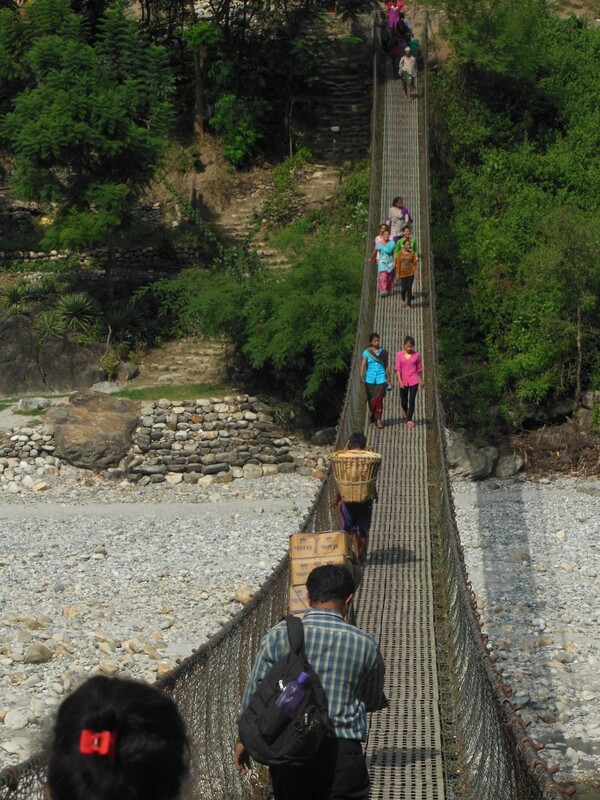 It was a short walk through the poverty stricken neighbourhood of the Varya to the Temple hill. There we were greeted by all kinds of vendors. 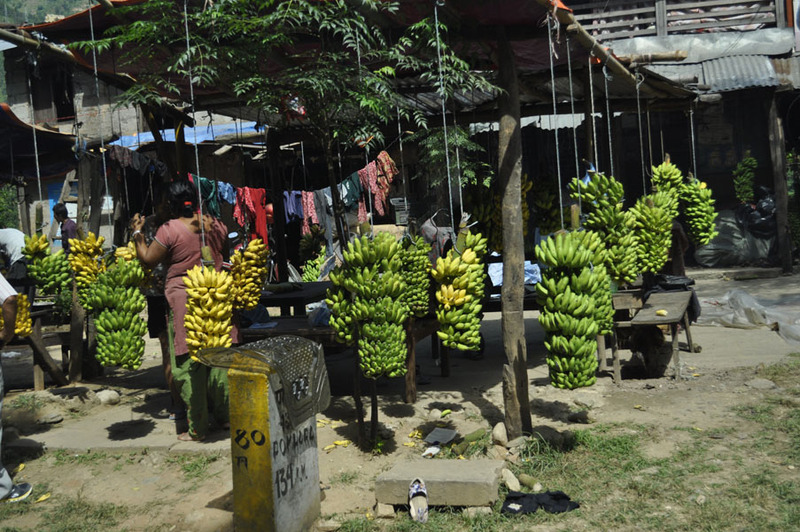 Some with touristy souvenirs, others with – yes, food for the Monkeys already present and grabbing Bananas out of the backpacks of un-prepared tourists. There were Sadus, colourfully adorned with safron and orange robes, painted with sacred colours, offering us all a tika(red dot on the fore head – for a price, getting quite angry, ifff someone took a picture – without paying them for that…. 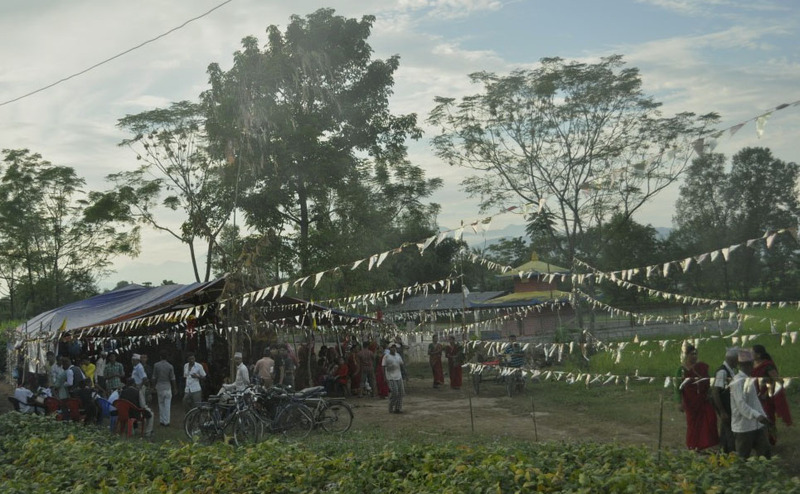 There also were all kinds of stalls offering all kinds of items, that the spiritually inclined visitor or pilgrim would need as offerings to the Hindu Deities and also for the Buddhist temples on the site. This is definitely a place, where all religions meet and mix, melt into each other and offer change and growth to everyone…. The eastern stairway up to the main site and past all the reliefs with scenes from the life of Buddha as well as the majestic pairs of Garudas, Elephants, Lions, Horses and Peacocks, all sacred vehicles of the Hindu Gods. 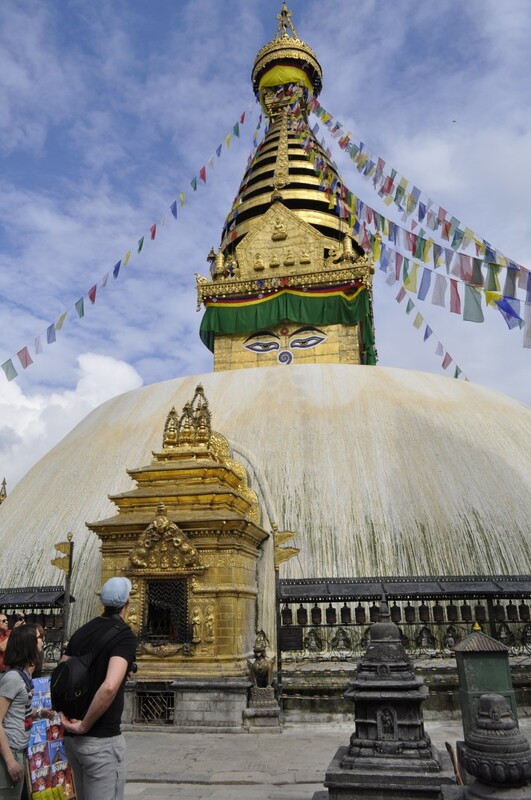 I was overwhelmed by the sights and sounds coming from all the different temples but also by the throngs of worshipers, some deeply in prayer as they bring and prepare their offerings…. but contrasted by thongs of tourists snapping pictures every which way…. 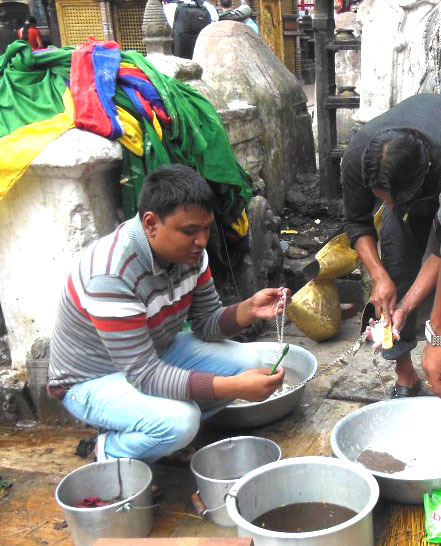 The burning oil lamps and incense fires, Flower offerings in front of the temple of Hariti, the Goddess that prevents smallpocks, and aids fertility, the Green Tara, the White Tara…. 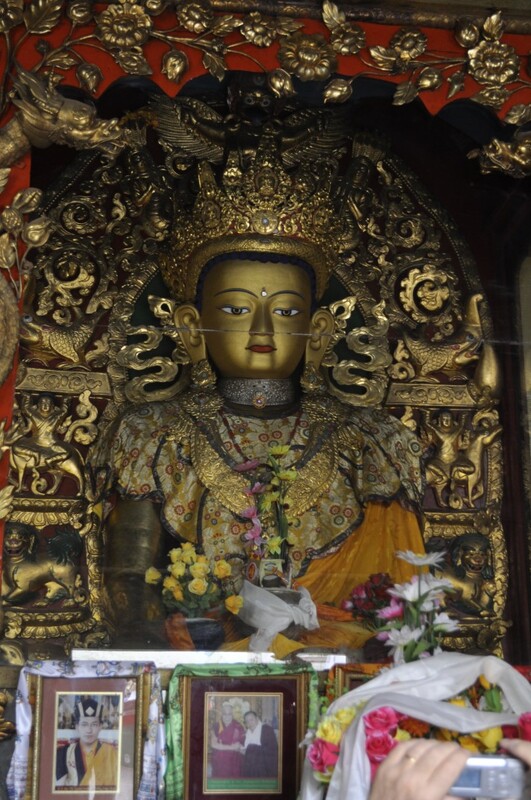 In aw we stood in front of the giant brass dorje – or varya = thunderbolt sculpture, the symbol of enlightenment, that destroys ignorance and incidentally symbolizes male Energy. 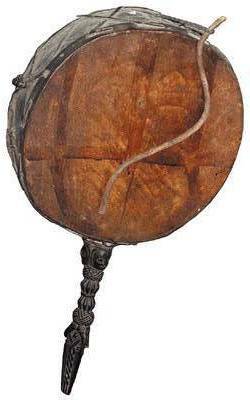 Not far of is its counterpart, a large ceremonial bell, representing the female Energy. 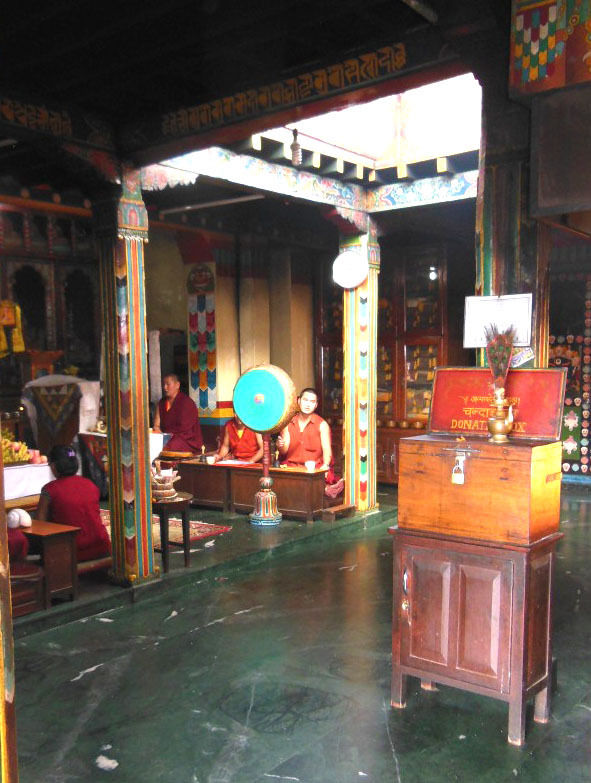 Tourists are allowed to take of their shoes and step into the entrance foyer of the Drongak Choelling gompa (Buddhist school) and even take a picture. 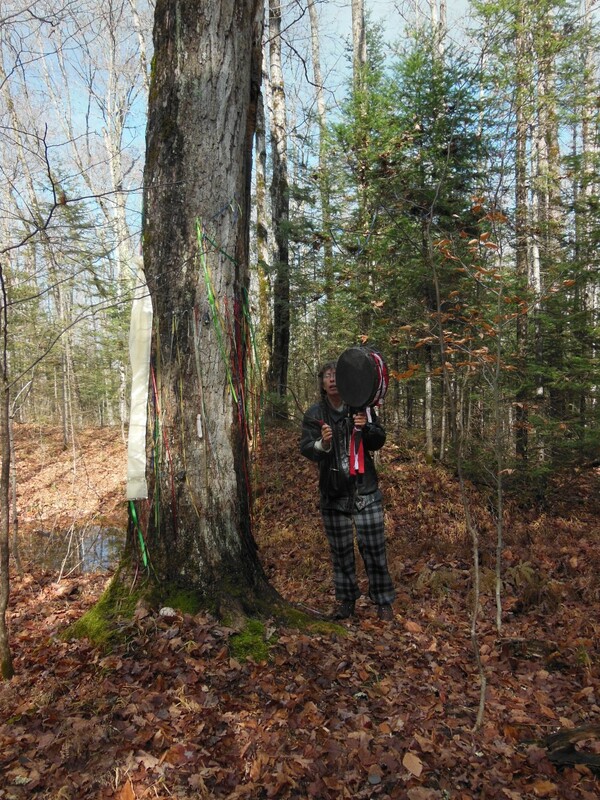 I would have loved, to just kneel down there and immerse myself into the chanting – and the hypnotic sound of the drum. 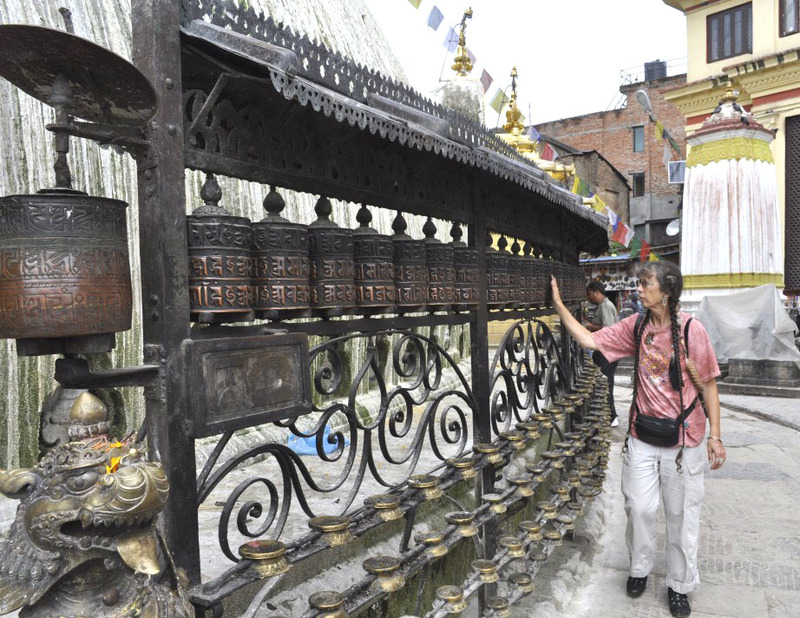 We circumambulated the stupa turning the prayer wheels. I thanked all the Spirits of Place to allow me to be here and see all this magnificent syncretizism, to feel the energy and to feel welcome. We also walked through the Buddhist temple that holds the huge statue of the historical Buddha. 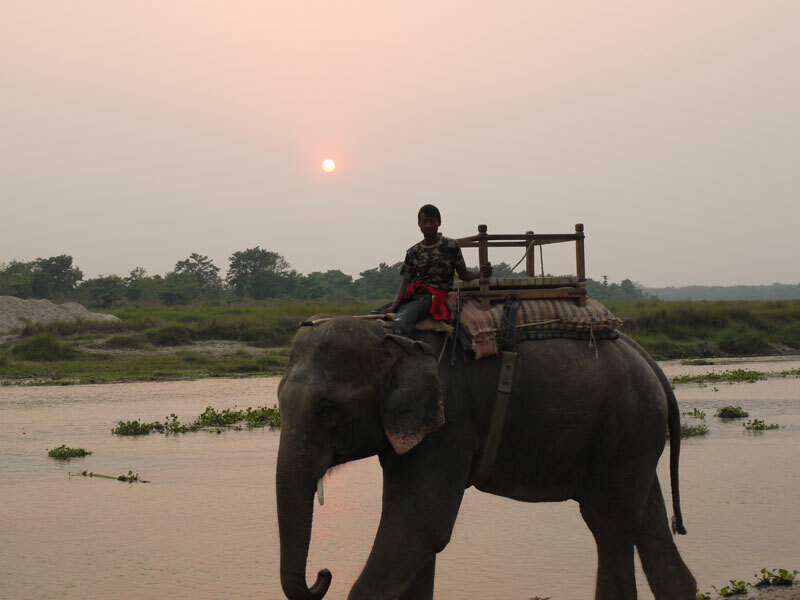 Bhola also explained the symbols of the 4 directions to us and sadly, then it was already time to leave. Peter and me alone – we would have spend the day here…. 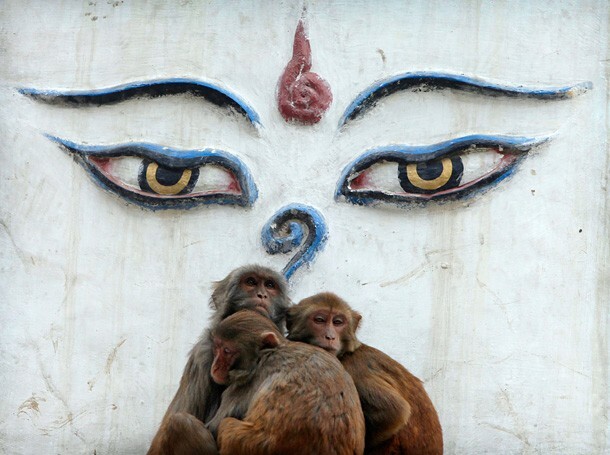 We would have taken time to talk to the Monkeys…..
From Kathmandu to Chitwan National Park it is a distance of 185 km. So you would think, that traveling in a brand new van, about 3and 1/2 hours would do it…?? 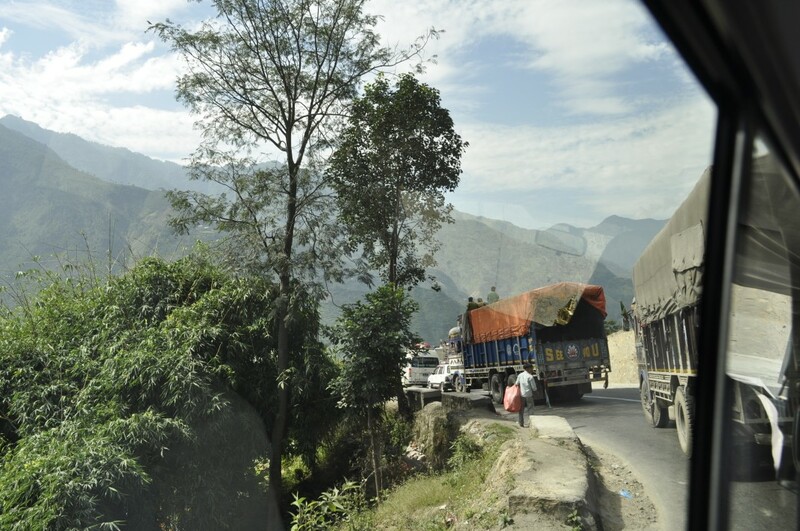 Well, We are in Nepal here and with Nepali roads and Nepali traffic…..
stop and go from pothole to pothole on a very narrow road . 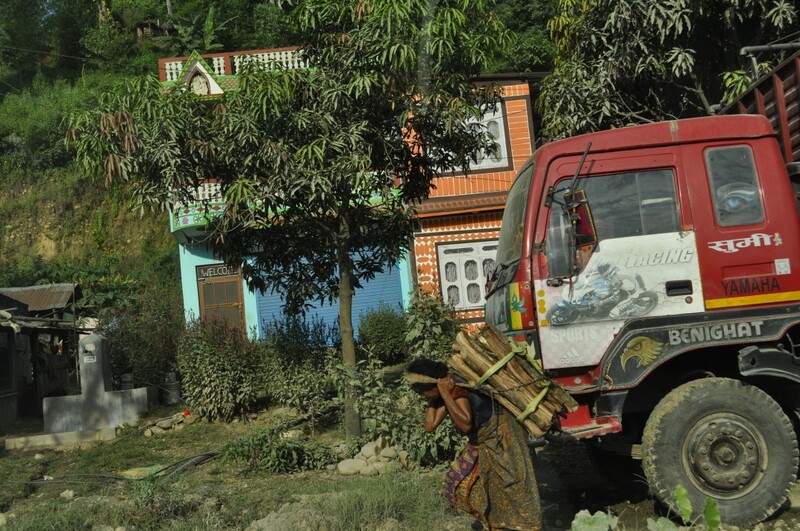 Switchbacks almost all the way…..
HUUUUUUGE Tata trucks coming up, bringing everything Kathmandu needs straight from India….. Buses, maaaany buses, big and small often with people on the roof. Vans overflowing with people and their luggage on the roof, the occasional Goat and Chickens and Ducks in cages and baskets…. 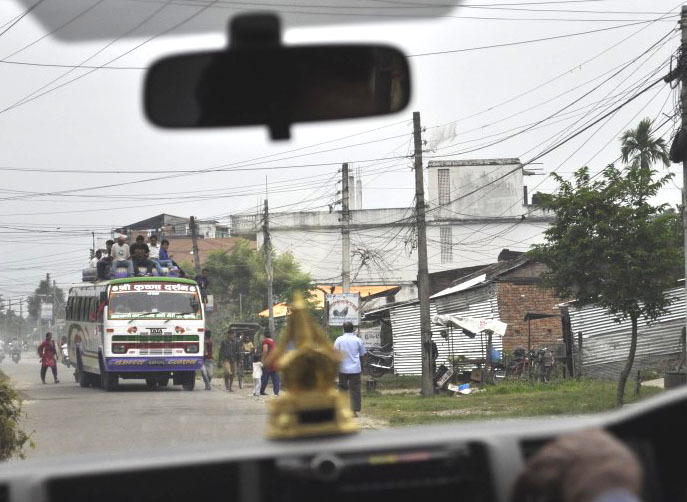 It is the Dashain festival and EVERYONE is going home…. 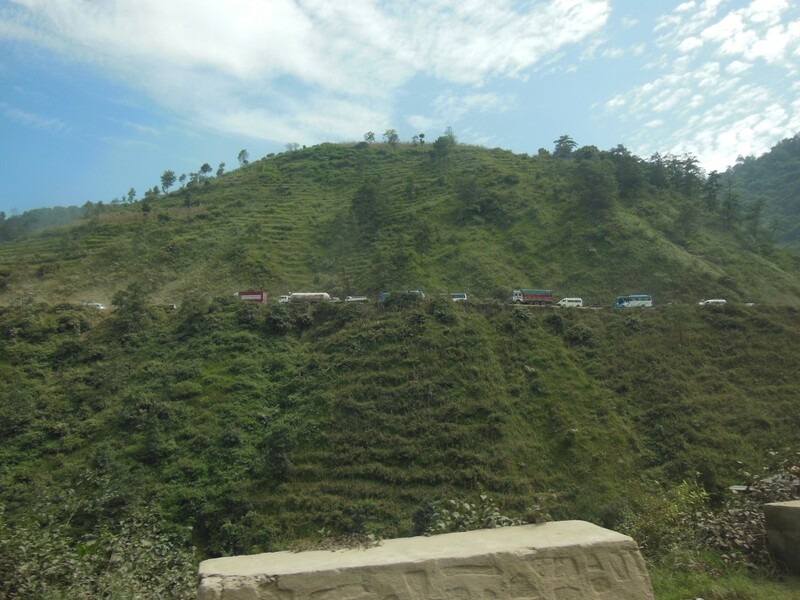 Our patient driver explains, that the traffic today is lighter then on other days – on this road…..
That did not help one of the rickety buses that – 2 hours ahead of us somehow did not get around one narrow switchback and capsized down the steep embankment. 18 dead. In-consolable survivors and loved ones crowd the narrow margin at the abyss…. We snake by the tragedy and press on… Down. It is getting warmer. We are going towards the jungle. The rivers and its beautiful bridges! Lunch that does not look all too healthy go my shamanic 6th sense…. We take pictures of butterflies in and among garbage. Then on and on, narrow winding pothole avenue to Bharatpur. There it gets reallllly bad! 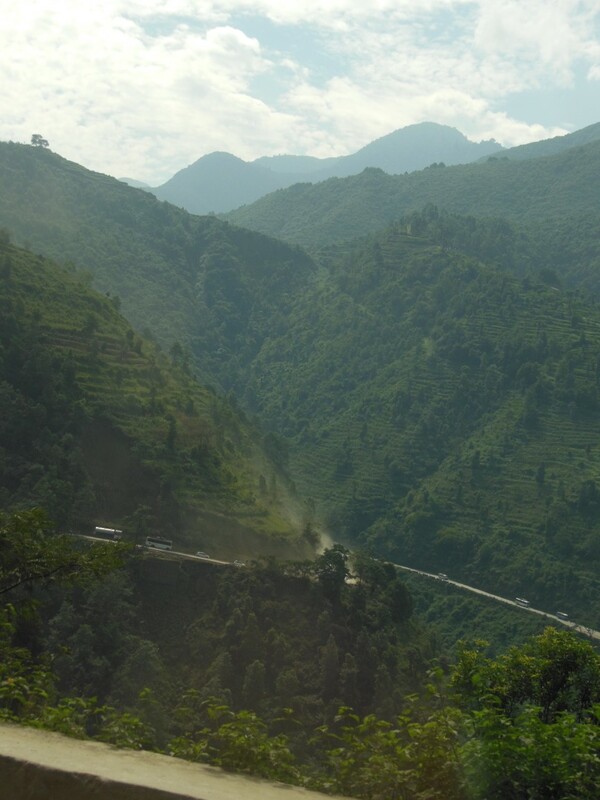 The last 18 km to Chitwan the road is one ripped open crater. The ever present motor scooters honk and zoom by, we pass rickety cars and other strange vehicles. There are also lots of people on the road, there are all dressed in their beat outfits – for the festival. We want to use even the last minutes of fading light to maybe see a bird. 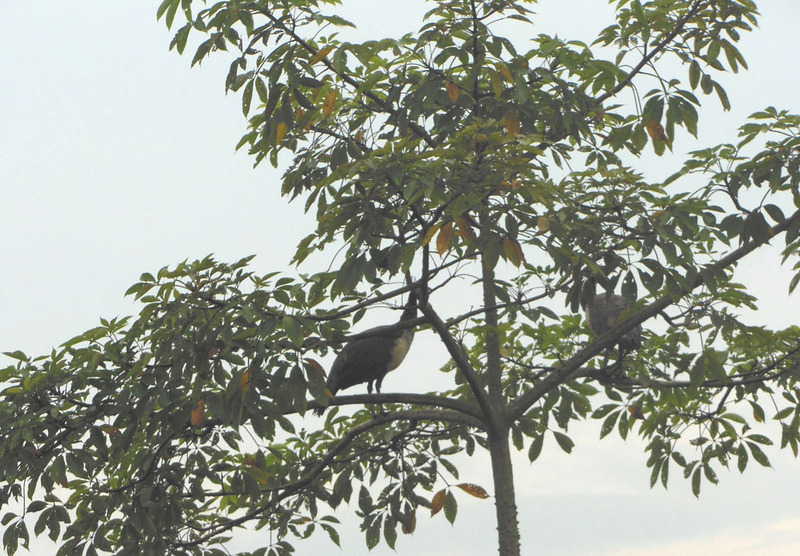 We are lucky and meet Krishna, one of the resort’s bird specialists. 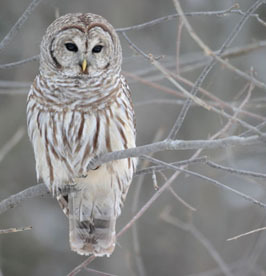 He sees the Owl pin I am wearing and tells us to follow him: Down a muddy path past some simple dwellings to a field. A large Tree about 10 meters away. “See there, on that branch! I am squealing for joy and excitement! Through our light sensitive binoculars we can clearly see her! 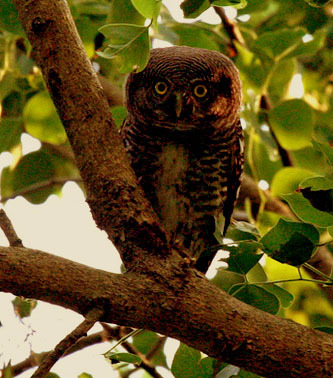 My first Chitwan Bird is a little Owl, looking a lot like Lira! To the Nepali shamans Peacock feathers symbolize the all seeing eyes if the Gods. 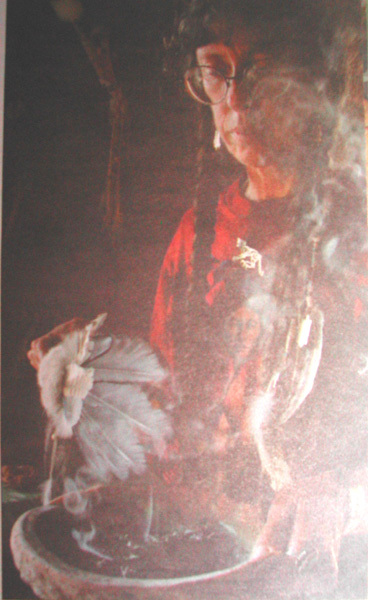 That is, why a headdress of Peacock feathers is worn during shamanizing. 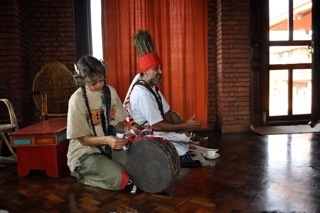 As Medicine Gifts for Bhola and also for the other Nepali shaman teachers I had brought Peacock feathers. And Peacock can eat poison, without getting sick! I had encounters with wild peacocks at home in Ontario of all places! 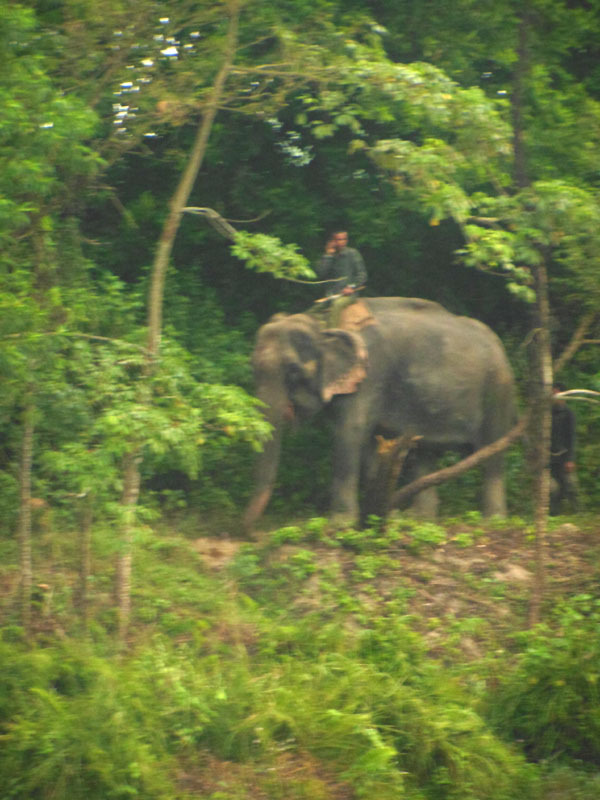 A bit blurrrry, but – Elephant guide and his cell phone!? 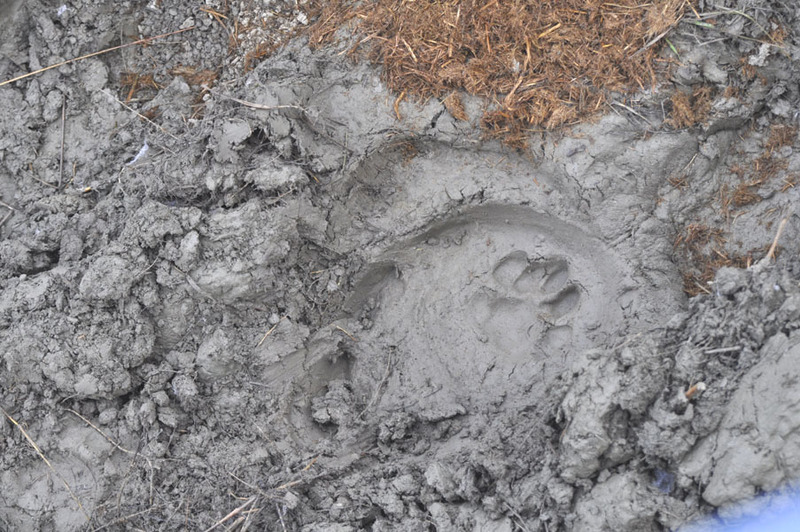 There also were Tiger paw prints at the watering hole…. Such a nice print! ..And all alone too! Very “Nice prints!! Always RIGHT in the verry middle of an Elephant foot print! 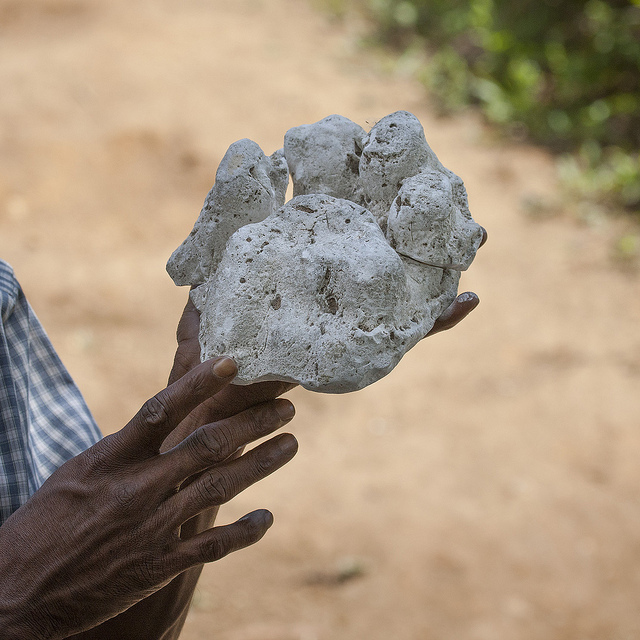 When I held out my left hand, I could sense no Tiger, just the very clever guides , creating some “artwork”…. …So iffff the paying tourists do NOT see any Rhinos on these outings, THAT is the reasonable explanation, Why! … A little small for a Tiger, but maybe a young Leopard? Ganesha is the remover of obstacles and a VERY revered Spirit. Statues of him are EVERYWHERE!. Richly decorated with red and yellow colour, Marigold Flowers and offerings of all kinds. 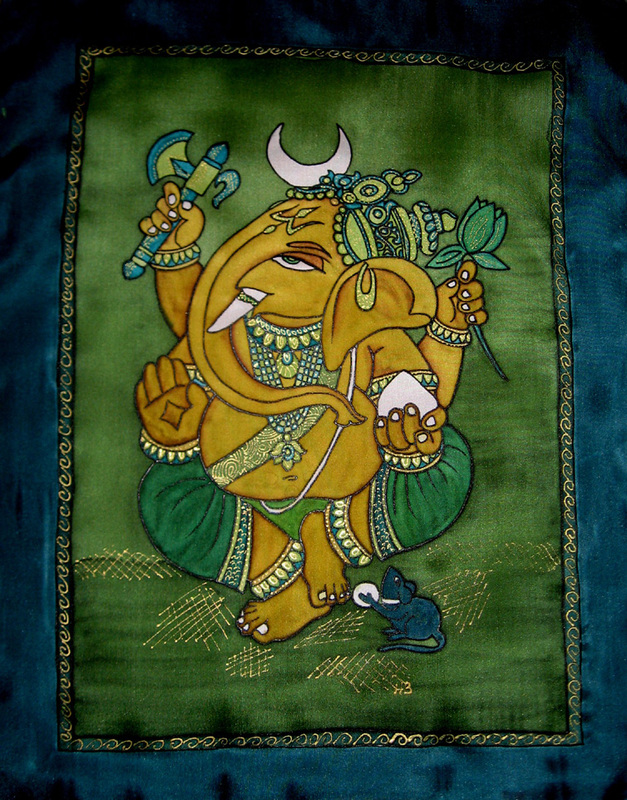 Bhola teaches: Tuesday is his day of honour, so this Tuesday we will journey to Ganesha. Ganesha has another Animal as a means of movement: A little Mouse / Shrew! I am reminded of a Cartoon with an Elephant and a Mouse…..
Our next journey assignment was, to journey to Ganesha and ask him to remove an important obstacle in our life. Hey, wait a minute, Bhola! It is just after lunch and I ate a WHOOOOLE LOT and ifffff I now lay down I am going to fall asleeeeeep!!!!! This is not my personal best time for journeying. But never mind that. It is an excellent exercise to practice journeying in these condition, for a time and day when there is a client in need and it counts….. So when Bhola starts drumming, off I go…..
That is, what I jotted down in my diary. We were all there: ll my Miahanits, also, oh shock the pair of Tigers, sitting together, hissing in unison…. There was also the Rhino – and all the other Animal Spirits – the ones that were not chosen by one of the participants, when we were asked to choose our personal Animal Guide…. I was upset, seeing the mighty Rhino reduced to I lifeless clay figurine, because I did not choose it. I felt horrrrrrible and guilty …..
Fretty however was in full action: Mutte3ring loudly and digging around in some leave litter, tossing sticks, leaves and garbage here and there, until he grabbed something and pulled it out: A small Mouse with a rather un- Mouse-like short tail! Obviously not, because these 2 were becoming fast friends! 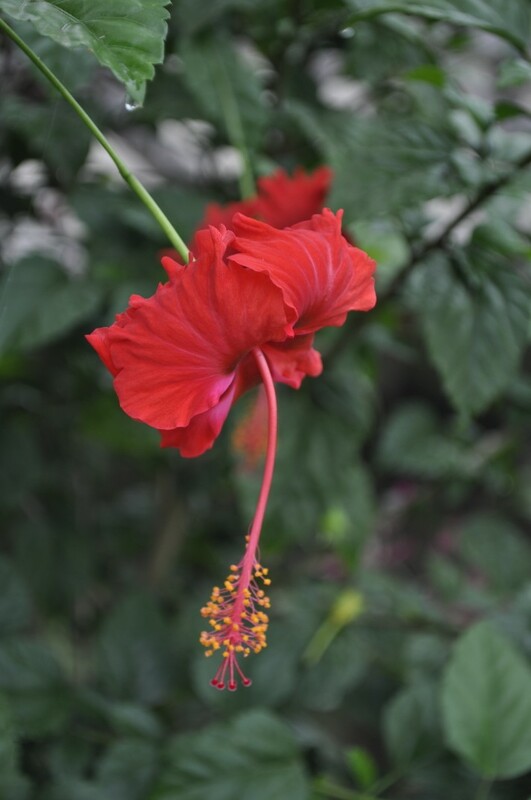 All kinds of people, Spirits, Flowers and “stuff” drifted in and out of the scene…. Suddenly there was Ganesha sitting on sort of a painted pedestal. He was all green. Ganesha however had a baseball bat like wooden stick. All of a sudden he hit with this stick onto the clay Rhino and it scattered apart into large pottery shards. Out of these however came a small gnome, that uttered a barrage of nasty belligerent words and scurried off into the underbrush, dirt and garbage by the road side…. I walked over to the scattered shards of the busted Rhino. “ And I,” I asked “ I did not choose you! I touched one of the shards and >>Boooooom! “Good for you you did NOT choose that Rhino! See, what came out of it! You would have gotten nothing but….. obstacles! He waved a large black tail of ?? hair?? He brushed me and the floor around all of us with that whisk…. then he said: “Go, get your own Rhino! Oh yes, there was the call back! And yes, I got my own little Rhino! At the pottery market in Bhagtapur one of our group friends saw a teeny tiny Rhino, just like the one in the Animal circle tray in the ritual room and – I got that as a little present. 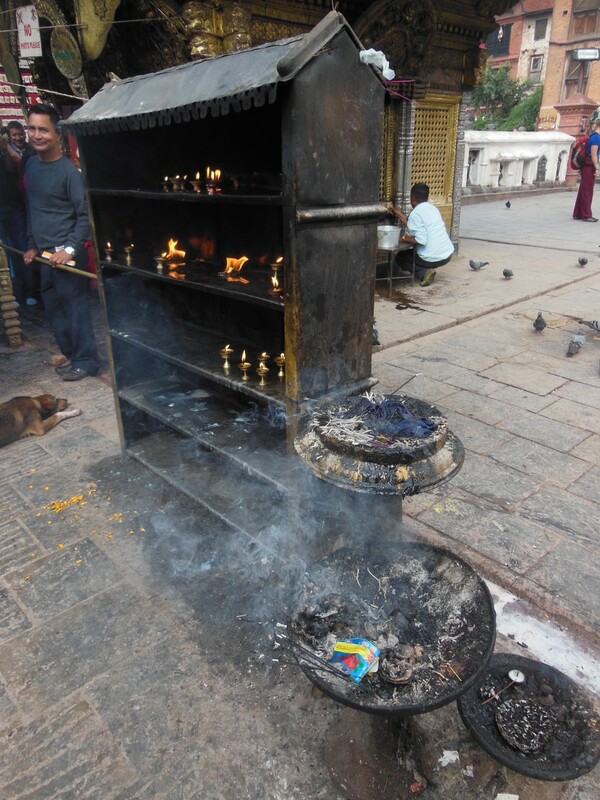 It is the one now with my Nepali Shaman Altar things…..
What obstacles should Ganesha remove for you?